Regimental Insignia upon the white field. 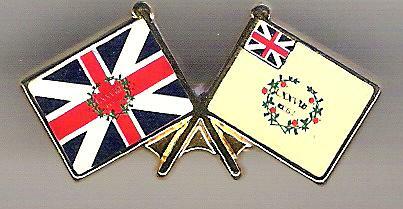 The King's Colour is the Union Flag used from 1603 to 1801.
and the Cross of St. George (England). It is emblazoned with the Regimental insignia. The dreaded Highland Broadsword! Symbolic of the 78th Highland Regiment was its Highland broadsword. From the mid 16th century, basket hilt swords were in common use in Scotland. All basket hilt swords after 1746 were of military pattern. These were essential weapons for the Highlanders and the favourite fighting method was with a broadsword in one hand and a targe (shield) on the other arm. 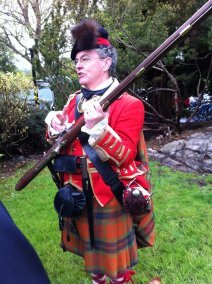 The musket we use is the "Brown Bess" Musket which has the record of being used the longest in the British military, more than 150 years. The loud bangs and billowing smoke give a dramatic glimpse of what battle scenes looked like 200 years ago. edition of the Fort's Despatches Newsletter. 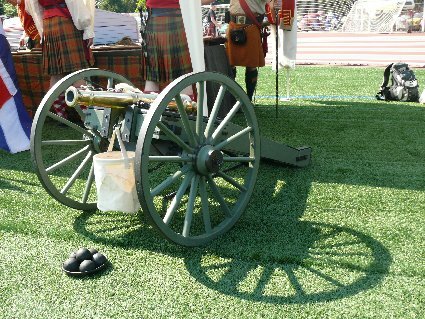 (c) 2014 78th Fraser Highlanders Fort Fraser Garrison, 1st Signal Corps.